On Tuesday 19th January there will be a Workshop at New Threads, Weyhill Fairground when we will be making stuffed toys using Simplicity pattern 8044. 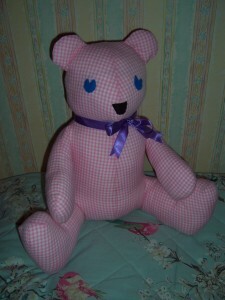 I have already made the Rabbit (see a previous post) and over the weekend I have made the Teddy Bear. As I did not have any embroidery floss to hand, I used small pieces of felt for the nose and eyes and finished off the project with a Lilac bow. There is also a Puppy Dog included in the pattern and I have set aside the materials to make that version during the workshop. This is a great pattern for the beginner or advanced seamstress alike. There are just two main pattern pieces for each version and they go together like a dream. If I had more nieces and nephews of the appropriate age I am sure that I would make many more!